USF scientists seek to characterize the concentrations and isotopic ratios of trace metals in the Gulf Stream, a location of some of the fastest ocean currents on the planet. University of South Florida (USF) MarMITE laboratory scientists Tim Conway, Brent Summers and Ryan Schlaiss, Florida State University scientist Peter Morton, and USF Buck Lab scientist Travis Mellet completed a successful transit of the Gulf Stream from West End, Bahamas to West Palm Beach, Florida onboard R/V ANGARI. This research expedition, led by USF Assistant Professor Dr. Conway and funded by USF Research, collected surface water for analysis of trace metals, trace metal isotopes, nutrients, chlorophyll, nitrogen isotopes and Fe binding ligands. This type of clean water sampling was the first of its kind onboard R/V ANGARI and included the use of a boom operating off the port bow and the set up of a trace metal clean flow bench and sampling gear in the laboratory onboard. Back in the lab, the collected water samples will be divided among several laboratories and analyzed for dissolved trace metal concentrations (Fe, Cd, Zn, Cu, Mn, Pb, Ni), the presence of iron binding organic molecules (ligands), stable isotope ratios (Fe, Zn, Cd, Ni), chlorophyll concentrations, dissolved organic nitrogen, nitrogen isotopes, and macronutrient (N, P, Si, ammonia) concentrations. Dr. Tim Conway is a marine biogeochemist and Assistant Professor at the University of South Florida College of Marine Science & School of Geosciences. His current research focuses broadly on the cycling of trace metals such as iron and zinc in the oceans. These metals act as important nutrients for marine life, and are added to the ocean by a range of different natural and human processes, such as submarine volcanoes, marine sediments and atmospheric dust. 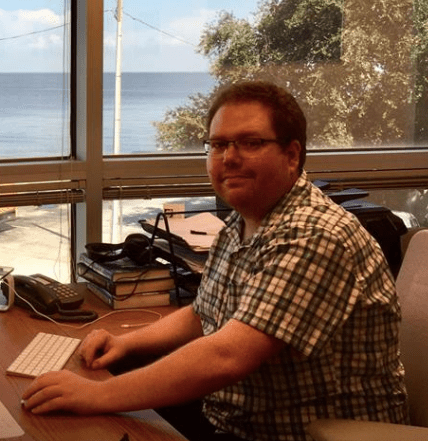 His current research projects include the cycling of iron, zinc and cadmium in the North Pacific, the South Atlantic, and Southern Oceans, as part of the International GEOTRACES Program. He is also very interested in how metal and nutrient cycling in the Gulf of Mexico and the Gulf Stream are linked to biogeochemistry in the region and in the North Atlantic ocean.